In this blog, we’ve been talking about unavoidably approaching winter for quite a while now. We’re not trying to be Team Debbie Downer here, but this is Chicago. And when the snow hits the ground, you better be prepared. This time we’ve assembled a list of tools that will help you deal with snow and ice without—literally—breaking your back (or the bank). Reliable snow blowing machine can set you back $700-$1,500 or more. 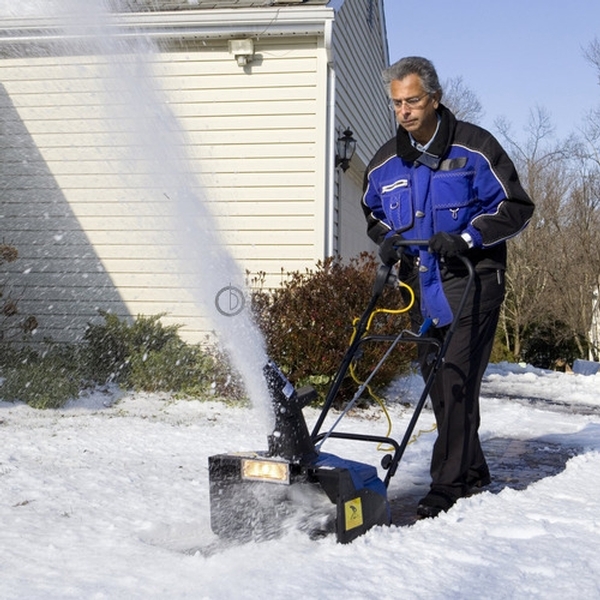 Plus, not everyone needs a full blown—pun shamelessly intended—snow blower. So get a snow thrower instead. Snow Joe, for instance, boasts a 15-amp motor and can move up to 720 pounds of snow per minute. Its durable, 4-blade rotor, constructed of heavy-grade steel, cuts a full 18-inch wide by 10-inch deep swath of snow with each pass. 180 degreeadjustable directional chute throws snow up to 25 ft. It features 20 W halogen light to clear paths day or night. Even better, it’s electric, therefore, requires no tune-ups and is virtually maintenance-free. If snow thrower sound like too intimidating or you don’t have that much ground to cover, get an electric shovel instead. Snow Joe Plus Electric Snow Shovel with Light is the compact, lightweight tool for quick and easy snow pick-ups around the home. It has a durable 2-blade paddle auger and clears a path 11" wide and up to 6" deep with each pass. The shovel throws up to 300 pounds of snow per minute as far away as 20 feet. It’s portable and small enough to fit into a hall closet. Even electric snow clearing gadgets can be pretty noisy and not everyone can tolerate noise. Even if you’d love to fire it up and take it for a spin, your neighbor may firmly disagree. If that’s the case, you may want to learn more about a “Wovel.” It’s a wheeled snow shovel that’s designed to reduce the physical strain of shoveling and the related risks of back and heart injuries. It looks… shall we say… interesting, but some independent studies confirm that it does reduce the risk of back injury and wheeling the amusing looking thing puts virtually no stress on your lower back. 4. SnoBrum (for your car). Keeping your paths snow and ice-free is important, but don’t forget to take care of your car too. After all, it does get you places while keeping you nice and warm. Snow removal is part of every Chicago resident’s life during the winter. While shoveling snow is considered a good workout and generally is a very good and admirable deed, if the winter is snowy and long, a little cheating is completely fine. Get some fast-acting snow melt to keep your paths ice-free and save your energy for something more fun… like leaving the house and meeting up with some friends. Snow Joe ice melt is eco and pet friendly. It’s enhanced with CMA (calcium magnesium acetate) for fast and effective results. It will not harm grass, wood, concrete, metals, or other vegetation when used as directed.